2 Bedroom cottage, a few hundred yards from beach, Marina & local amenities. Stones Throw Cottage is a Grade II listed fisherman’s Cottage that has been sympathetically restored to a high standard with sea views across the bay. This beautifully furnished 2 bedroom cottage is ideally placed for a traditional seaside holiday. Within a stones throw are restaurants, shops, Shoalstone Lido and the picturesque harbour. Steps lead up to the front terrace ideal for breakfast with a view. The property has free parking, WiFi and central heating. The living room boasts a log burner for those wintery days, ideal to sit and play the board games or watch one of the many DVD’s that are available. 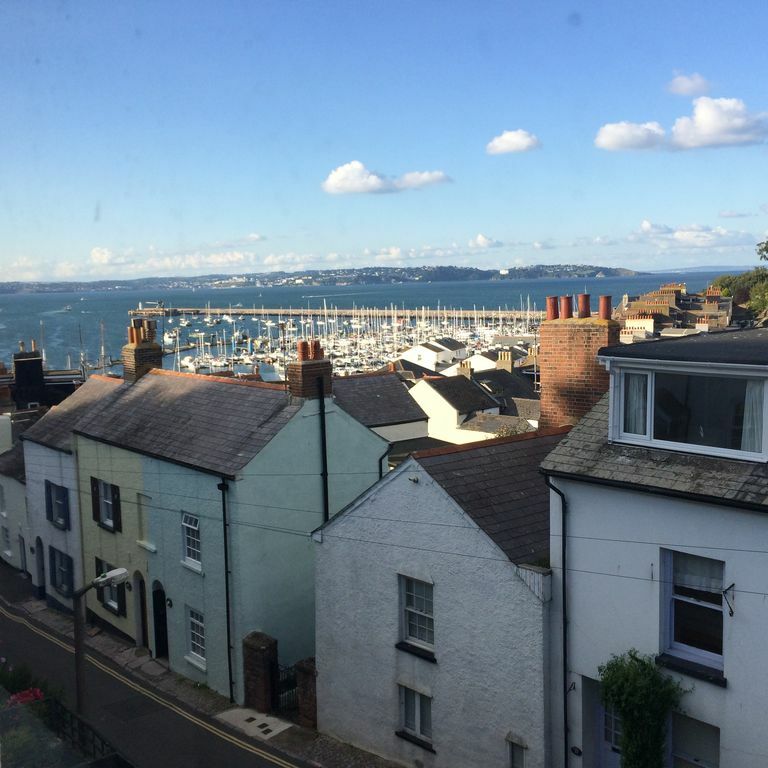 With two bedrooms, a large bathroom with a free standing claw foot bath and a small courtyard ideal for drying off swimwear after a day on the beach, Stones Throw is ideal for families wishing to explore Brixham and the surrounding area. The kitchen boasts under floor heating, Rangemaster cooker, dishwasher and washer/dryer. We have lived in Brixham for many years after falling in love with the local area and people whilst on holiday. toilet, tub, shower, Bathroom is on the ground floor & boasts a claw foot bath. Breakwater Beach is 800 metres away. Quilt, pillows and bedding are provided. Washer/Dryer provided with a small amount of washing powder. Log Burner Firewood, kindling and firelighter are provided. There is a dedicated parking space located 350 yards away on the harbour. Firewood, kindling and firelighter are provided. Corner sofa, coffee table, log burner, Flat Screen TV, DVD player, DVD library, assorted board games. Maps of local area. Views of bay. Integrated dishwasher. The Dishwasher tablets are provided. Rangemaster electric five ring hob. Rangemaster electric double oven and separate grill. Full kitchen. Washing up liquid, dishcloth, tea towel, oven gloves & hand wash are all provided. A selection of board games are provided. Everything was perfect about the cottage. It's clean, well equipped and nicely decorated, everything you can wish for. The cottage is in an amazing location, less than a 5 minute walk to the harbor and shops. Overall a fantastic break away and would recommend both the cottage and Victoria to everyone. Really enjoyed are stay , great location for the restaurants and coastal walking. The property was great 5☆ , can't fault it in any way . Lovely to relax in the claw foot deep bath or in front of the log fire. Very nicely decorated and equipped. An ideal place to stay for our short break in February. Very well equiped (especially the kitchen) and maintained cottage with a stunning view. Good liaison with Victoria. Highly recommended. Thank you for taking the time to provide a review, Glad that you enjoyed your stay. Thank you for the kind review, I'm glad that you enjoyed your stay at Stones Throw Cottage. The cottage had everything that we needed and the children loved it! They enjoyed the selection of books on offer and loved looking out of the main bedroom at the views of the harbour. The cottage was extremely comfortable and great after a day of exploring Brixham. Apart from that though everything was perfect - thank you very much. We would definitely come back for a holiday and recommend to others. Brixham is an excellent place to be based for exploring South Devon. Dartmouth, with it's marina, castle and naval college, Dartmoor national park for awe-inspiring walks, and quaint Totnes town are just some of the places of interest. Great location for fishing from either boat or on the shore. Within walking distance of Berry Head and the 2 Napoleonic forts. Close by are the wonderful cafes, pubs and restaurants many of them serving fresh fish for which Brixham is famous for.